Do you need a tool to plan your monthly expenses managed as per your projected income? 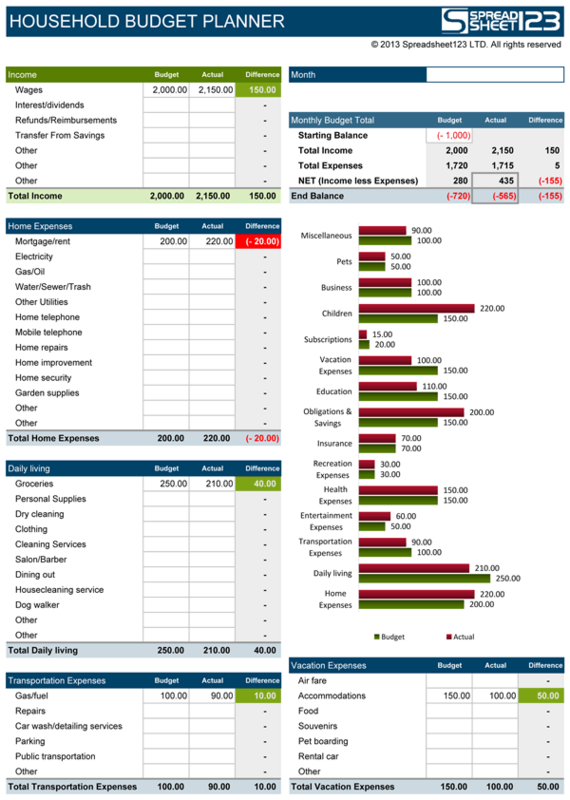 Household Budget Planner is ideal for planning monthly expenses in line with projected income. It contains "Children" and "Business" categories which is great for a family budget planning. Household Budget Planner helps in recording the details of the income earned along with the monthly expense details of a family. The spending spreadsheet records the list of all the varied kind of expenses and payments that a family incurs in a month. It contains categories ranging from "General Home Expenses", "Daily Living Expenses", "Transport Expenses", "Entertainment Expenses", "Vacation Expenses" , "Health Expenses", "Children Expenses", "Business Expenses" etc. It covers almost all type of expenses any household may incur in a month. It is a great tool for a household budget planning. 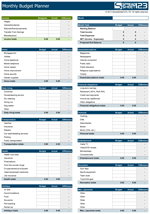 Household Budget Planner has a single worksheet with different sections. The section on INCOME (highlighted in green colour) could be used to record the details of the expected and actual income generated in a month from various sources be it wages, interest and dividends or amount transferred from savings within a month. There are two columns with name "budget" and "actual" which can be used to fill respective amount for each income source. "Budget" Column could contain the expected amount to be earned from the respective source while "Actual" would contain exact final value for the same. "Difference" column would use predefined formulas to calculate the difference between the actual earnings and the expected monthly income alongside each category. Total for each column is calculated automatically at the end of this section. 15 types of expenses (Home, Daily Living, Transportation, Entertainment, Health, Recreation, Insurance, Obligations & Savings, Vacations, Education, Subscriptions, Children, Business, Pets, Miscellaneous) that are generally incurred in any household have a section (highlighted in dark blue colour) within this spreadsheet. Each section has further subcategories to help individual remind and categorise the expenses that could be done within a month. Just like estimated and actual expenses along with difference column have found place in each of these 15 expense sections. The subcategory list is extensive and almost cover all type of expenses related to the name of the section. There is option to add more subcategory that individual would want, 2-3 Placeholders with name "other" is provided in each section for same. Total for each column is calculated automatically at the end of each section. 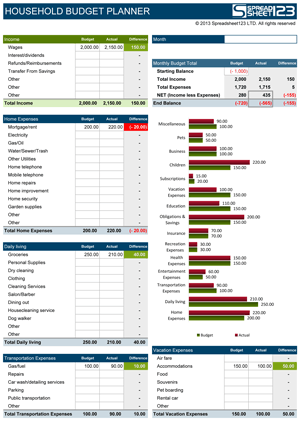 There is a bar chart within Household Budget Planner that neatly displays the total of each type of expense with estimated and actual values. On entering the expenditure details in the spreadsheets the pre-defined formula helps to create the entire expense chart of a family. The graphical representation make the understanding process much easier and can give insight to individual on what's going right or wrong in reference to his or her expectations and with what kind of expenses. 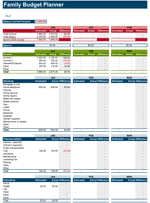 The Monthly Budget Total section in Household Budget Planner uses the pre-defined formulas to give a tabular view of the actual and estimated income along with its difference spent by a family in a month. The spreadsheet also gives the net amount that a family has saved during the month. Begin by downloading the template and you can enter values in Budget columns for each subcategory in each section for income and expense at the start of the month. Totals in each section will be automatically displayed. 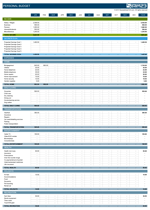 Predefined Formulas will calculate and fill the budget column of "Monthly Budget Total" section. In case you expect some amount or debt from preceding month to be left over, you may add same in "Starting Balance" in "Monthly Budget Total" section. We recommend you to regularly update the income and expense section as incurred during the month in actual column in each section alongside different subcategories. At the end of month, Household Budget Planner will provide detailed summary on net earnings of a household for a particular month. 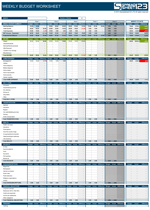 Household Budget Planner shows the estimated and actual spending that a family has incurred under various categories. The family could analyze the results and take decisions to avoid unnecessary expenses so as to increase the savings. The Summary section on the top gives the difference in the income and the expense and clearly shows if the family was able to save some amount or has come under a debt. The template is best suited to plan a household budget efficiently for a small family. How to calculate the net savings of a Household? The Household Budget Planner calculates the net savings with the help of pre-defined formulas shown as "End balance" in the section "Monthly Budget Total". The total income for a family for the entire month is calculated by consolidating the net income earned under each subcategory. Similarly the spending total is calculated. The sum of the balance amount, income earned and income spend gives the savings amount for the family. Any carry forward amount (Positive or Negative) from preceding month is handled with in the formula. What is significance of NET (Income less Expenses) with respect to the results? NET (Income less Expenses) for a month signifies the difference between the expense and income generated with in that particular month. It is different from End balance which inculcates the carry forward amount (Positive or Negative) from preceding month. Number one budgeting step you have to stop avoiding? Budgeting tips when you are on a low budget? How to stick to a budget and save money?